You DO have time for self care! Imagine what your life would be like if you were in control of your stress. You're not totally overwhelmed by your to-do list. You actually enjoy your time with your family. You don't feel like a cloud is constantly looming over you, adding unneeded pressure to your life. Just 10 minutes a day can make a huge difference! Taking care of yourself doesn't have to take up all of your time! In just 10 minutes a day, you can dramatically reduce your stress levels. You can build the skills you need to beat the overwhelm and finally live the happier life you want. If you could just automatically feel less stressed, you'd have done it by now. These videos teach you techniques that you can use every day to let go of your worries. You'll get access to ten 10-minute easy-to-follow videos with a gentle yoga sequence designed to help you reduce your stress. Let's face it: you don't have an hour or more to devote to stress reduction. These videos are quick but effective. You'll really feel a difference in just 10 minutes! You've heard how great yoga is for stress reduction, but you don't have the time or money to head to studio classes regularly. Get all of the benefits of yoga for less than the cost of lunch at a restaurant! 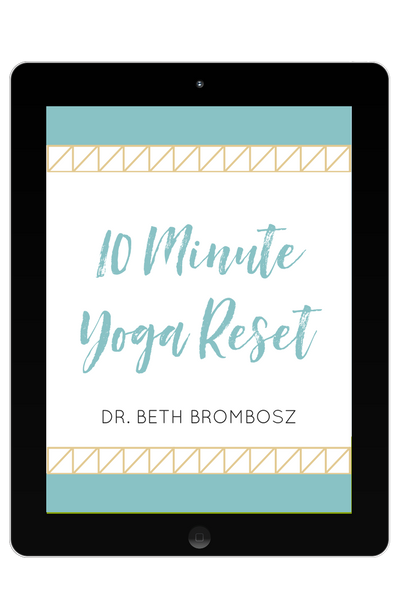 Get instant access to the 10 Minute Yoga Reset now! ​Download ten 10-minute yoga sequences designed to help you de-stress with gentle yoga. I've been doing yoga regularly for a few years now but this daily challenge got me back in tune with my breathing during yoga. It also motivated me to take 10 minutes a day to breathe and stretch, and my body definitely feels better because of it. Beth brought a depth of yoga knowledge which showed in the poses she chose and the sequence between them - while balancing that knowledge with the guidance and cueing to make each day's video incredibly approachable for even a novice like me. As a runner and father to a young (and very energetic!) son, I really appreciate having this new tool in my toolbox, and look forward to applying the lessons (the poses, the breathing, the mental tips) to every aspect of my life! This was a great introduction to the use of yoga for stress relief and anxiety management. It was also a good foundation for starting a personal yoga practice. After following the videos for 10 days, I felt that I really craved the energy and focus that yoga gives me, even in short increments. I also felt that even when I was very tense or stressed, I had yoga and deep breathing to turn to as a way to still my thoughts. The Best Time to Start Controlling Your Stress is Now! You CAN start to overcome overwhelm and reduce your stress in just 10 minutes a day! With my simple 10-minute yoga videos, you'll be taking the first easy step toward living a healthier, less stressful life. $25 Get access for only $10!